In a highly competitive business environment in today's world, staying on top of the game is crucial. Many organizations today, however, minimize the importance of Marketing. 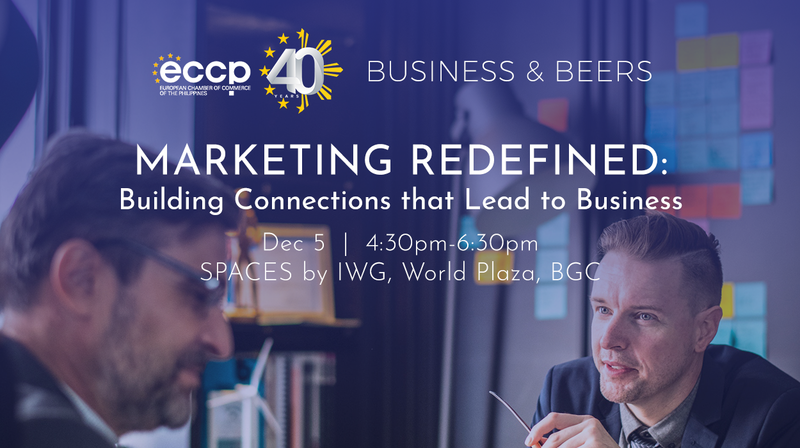 But for someone like Lars Wittig, CEO of Regus Philippines and SPACES by IWG, he believes that the heart of any organization is having an exemplary Relations Marketingstrategy. For a seasoned business leader like Lars, and with his extensive Marketing and PR experience in various markets, he advocates the importance of combining PR and external affairs with effective networking, building relationships, and traditional marketing. So how do we make the perfect mix of all these? Join us this coming Wed, 5 Dec 2018, as we uncover how Lars became the global innovator that he is today through effective relations marketing. He will be sharing best practices from a life in Marketing, from Coca-Cola to Regus and SPACES. Expect to learn what defines good relations, how to network, the real value of Public Relations, and how traditional marketing can still be vital today. The talk will be followed by a networking session where you can immediately apply the things you've learned. As Country Manager for the Philippines, Lars has managed an expansion from 4 to nearly 30 business centres since year 2012, including the first business locations outside Metro Manila with centres in Cebu, Davao, and Clark. Lars first moved to the Philippines 25 years ago, where he has worked for the Coca- Cola Co. as Marketing Director, Dole Packaged Foods as Marketing Manager Asia, and EAC Philip Morris distribution. Throughout the Philippines, Lars has first-hand experience driving business in over 100 cities and municipalities with focus on consumer activation at Point-of-Sales as well as above-the-line marketing. Regus was awarded best Employer Brand in the Philippines in 2018 and Lars was awarded Asia CEO Expatriate Executive of the Year 2014. Within IWG, the Philippines is often recognized as best performing market regionally and even globally. Registration deadline by 30 Nov 2018.